Nestled in the Balkans & next the Black Sea, Bulgaria is actually a little known destination for the curious architect. A blend of European influences, including Persian, Greek, & Slavic came together in this Eastern European country to create a dynamic architectural landscape. And, a former part of the Ottoman Empire, societal values of safety & practicality are also reflected in its edifices. Explore this Balkan nation & learn how Bulgaria’s rich history & cultural heritage are visible in the historic buildings still standing today. Plovdiv – Experience the long history of this Bulgarian city, including Philip of Maceon, the city’s founder, & the remnants of Roman influence & control. 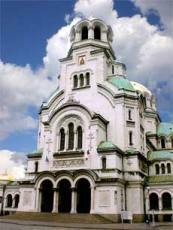 Sofia – The capital city of Bulgaria is home to both ancient artifacts and modern Bulgarian life and culture. Nessebar – Explore the old, well-preserved fishing town of Nessebar which still has monuments from a number of ancient civilizations, including the Thracian, Greek, Roman & Byzantine eras. Ruse - Also known as “The Small Vienna, Ruse earned its nickname because Italian, Austrian, Bulgarian, & German architectural influence. Upon arrival at the airport, meet your guide & transfer to your hotel in the city of Sofia. In Bulgaria’s capital city of Sofia, learn about the country’s history & how the different architectural styles coincide with the era in which they were built. For example, see early Christian ruins & temples from the Roman Empire. As Ottoman influence took over, see how the city’s architecture evolved into much of what you see in modern say Sofia. This morning, embark of your excursion to the Rila Monastery, the largest of its kind in Bulgaria. While you tour the monastery, take not of the exquisite architecture, including the frescoes in the main church. Visit the monastery museum. In Melnik, you’ll have the chance to see prominent architectural monuments, like the Kordopulova & Pashova houses, which date back to the Bulgarian Revival of the 18th & 19th centuries. Built in 11754, the Kordopulova house is actually the largest Revival building in the country. The house belonged to a wealthy, wine producing family, so the house features cellars carved out of the rock behind & beneath the house. Following your visit to Melnik, you will head to the village of Kovachevitsa. Kovachevitsa was actually declared an architectural & historic reserve for its unique architecture. Among some of the building in town are 18th century two- & three-story homes. The ground floor of these houses were designed to keep animals & store food. The upper levels were for the family. Today, you will visit Shiroka Laka, where tiers of Rhodope houses line both sides of the river. The houses were built in the characteristic style of Rhodope, including bay windows, wooden staircases, & wide rooms with the wooden couches along the walls. The local builders became famous throughout Bulgaria for their craftsmanship. This morning, visit Ancient Plovdiv, an architectural reserve. As you walk through the village, you’ll notice how multiple eras are captured in a single building as ancient edifices were retrofitted for modern life. The village still has many features dating back to the Roman age, including the Roman stadium, the ancient Forum, & the Ampitheatre. During the Revival, the houses built in Plovidv shared many common traits. They are particularly colorful & ornate, symmetrical, & have bay windors on the second floor. Inside, paintings & carvings cover the walls, ceilings, & even, furniture. Some of the most well-known Revival landmarks are the house of Stepan Hindliyan, the Mavridi house, the Nedkovich house, the Kuyumdzhieva house, the Balabanova house, etc. Explore another one of Bulgaria’s architectural reserves in the town of Zheravna. In fact, 172 houses have been declared monuments of culture. Here, you will see Revival houses that have been well-preserved & some that have beenr restoired. Like the other Revival homes, these are also decorated with beautiful carvings. Notice the town’s many fountains & narrow cobblestone thoroughfares. Take time to stop by Chorbadzhi Rusi’s house, the native house of Yordan Yovkov, the famous Bulgarian writer, or the home of publicist Sava Filaretov. Head to town of Nessebar, a reserve with history reaching back to ancient times. The town sits on a smalrocky península & is home to a number of ancient monuments, including some from the Roman, Tharacian, Green & Byzantine eras. The town is divided into old & new, each vibrant & full of entertainment. From Nessebar, continto to on Varna for a sightseeing tour of the city. Among your stops will be at the Archaeological museum which have one of Bulgaria’s richest collections. Their holdings include 55,000 exhibits ranging from the Old Stone Ages to the Late Middle Ages, featuring the Oldest Gold in the World. Head to Madara, a UNESCO world heritage site to see the famous Madara bareliefe, The Horse Rider. Dating back to somewhere between the 8th & 9th century, today this monument is a symbol of a young Bulgaria. This morning, explore the city of Ruse, also known as “The Small Vienna.” Ruse is Bulgaria’s primary port along the Danube River, & earned its nickname because Italian, Austrian, Bulgarian, & German architectural influence. This afternoon, visit Arbanassi, once a local trading post during 17th century Ottoman Empire. Local traders were renowned during this time & successful barterers resided in houses that looked like small fortresses. To passersby, these houses looked austere & harsh, with barred windows & little decorative quality. However, inside was rich with ornate features. Pay a visit the Konstantsalieva house, which dates back to the 17th century. It is one of the largest preserved & elaborately decorated houses in Arbanassi. During the 18th & 19th centuries, the height of the Bulgarian Revival, the town of Tryavna was a cultural center. It was here that the Tryavna Artistic School was established. As you tour Tryvana, notice how the town still carries the spirit of the Revival. For example, the Clock Tower, built in 1814, is a Revival period icon & sits in the center of town to this day. Continue on to Bozhentsi, home to more than 100 beautiful two- & three-story homes, preserved for their architectural value. Explore the town of Koprivshtitsa, where many of the houses are a great example of the architectural style during the Bulgarian Revival. Designers used vibrant colors as a demonstration of their individuality. Spend today at an area university. Take some time to tour the campus before sitting in on a class lecture. After breakfast, you will transfer to the airport for your return flight home.